Honeycrisp apple trees with Geneva rootstocks in a large nursery in Washington State. These trees will be shipped all over the United States for planting in large commercial orchards, small family farms, and backyards. With 600 acres of apple trees in Walden, New York, Jeff Crist faces a number of threats from nature each year. Fire blight, a bacterial disease that attacks blossoms, shoots, and limbs, has been known to kill off entire orchards. Replant disease, which reduces growth of new trees in soils that support the same type of tree year after year, can cause major losses. Aphids and cold temperatures can also cut into apple production. “The challenges from a horticultural standpoint are always there. You just have to try to do everything possible to minimize them,” says Crist, a fourth-generation farmer whose family has grown apples in the region for about 100 years. 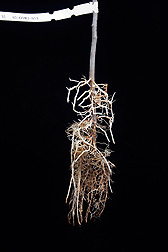 A typical rootstock. Millions of trees of some of America’s favorite apple varieties are grown on Geneva rootstocks. Crist and other apple producers are better equipped to face those threats because of a one-of-a-kind program in Geneva, New York, operated by Agricultural Research Service scientists and Cornell University. The program, overseen by Gennaro Fazio of the ARS Plant Genetic Resources Unit in collaboration with Cornell scientists, produces new rootstock varieties that will play a major role in the continued success of a $3.1-billion-a-year apple industry in the United States. Apples rank second, just behind oranges, as the nation’s most consumed fruit, when fresh and processed uses are combined. Commercial apple growers routinely replace trees every 20 to 25 years, and this year, about 1 in 5 of the new trees shipped from nurseries to growers—some 2.4 million trees—is on Geneva rootstock. Rootstocks from Geneva are also being used in some European countries, as well as in Brazil, Chile, New Zealand, South Africa, and Uruguay. Geneva rootstocks are in high demand because they have proved to be effective at overcoming many of the obstacles growers face in producing a bountiful harvest. “The Geneva program has made major contributions. It’s given us new tools to combat fire blight, replant disease, woolly apple aphids, and winter cold, among other problems,” says Phillip Baugher, who is chairman of the research committee for the U.S. Apple Association and president of Adams County [Pennsylvania] Nursery, which propagates 600,000 apple trees annually. Each tagged set of these Gala apples was grown on a different type of Geneva rootstock. The variation among the sets illustrates how the rootstock can affect fruit color and size and, ultimately, eating qualities. Most commercial apple trees are bred in two parts: the fruit-bearing scion and the rootstock, which forms the foundation and roots. The two parts are completely different and address different needs, so the dual approach makes breeding easier. The scion determines the variety of apple. The rootstock determines the tree’s size, when it will begin to bear fruit, and how well it resists soil diseases. Rootstocks also transport nutrients from the soil to the scion, which is critical to the tree’s survival, health, and productivity. “Certain scions may do better with certain rootstocks. Figuring out the right pairings is part of the challenge for growers. They have to mix and match,” Fazio says. Breeding apple rootstocks is a time-consuming process. Each rootstock is field tested for about 10 years in different environments to evaluate its strengths and weaknesses in the climates and soils of the 29 states where commercial apple trees are grown. Along the way, many rootstocks fall prey to soil diseases or perform poorly when exposed to different climates. One example shows the time sometimes required: Three rootstocks released by ARS and Cornell scientists in 2010 were based on crosses of trees done in 1976. The work, however, pays off. Since the 1970s, the Geneva breeding program has produced trees that are 10 to 20 percent more productive and are better at taking up certain nutrients from the soil. 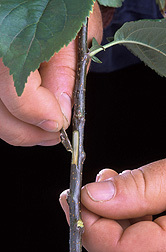 Commercial apple trees are usually produced by grafting a scion onto a rootstock. The scion determines the apple variety, and the rootstock determines tree size, disease resistance, and more. Here, a section of the rootstock’s trunk is chipped out where the scion will be attached to it. Efforts start with a rigorous screening process at an ARS site based on the Cornell University campus in Geneva that includes apple rootstocks and trees from throughout the world. Seeds made from the hybridization of plants with promising characteristics are germinated in a greenhouse and inoculated with a series of pathogens. The pathogens usually kill 70 to 80 percent of the seedlings. Surviving rootstocks are then screened with DNA markers associated with aphid resistance and productivity. The remaining seedlings are then field screened in Geneva and sent to nurseries and research sites across the country and overseas to be evaluated for cold tolerance, response to different soil conditions, and disease resistance. A completed graft. The scion has been attached to the rootstock. One major achievement in the rootstock-breeding program has been advancing resistance to fire blight. Significant fire blight outbreaks in New York, Michigan, and Washington State have caused millions of dollars in annual losses over the years. It’s also a concern in Europe and New Zealand. A fire blight epidemic in New York and Michigan in 2001 and 2002 wiped out entire orchards. In the Northwest, many growers refused to plant new orchards until their apples could be grafted onto resistant rootstock. All rootstocks released from Geneva in recent years are tolerant or immune to fire blight. In the wake of the fire blight outbreaks, rootstocks from Geneva are proving instrumental in allowing apple producers to plant new varieties that are very fire blight susceptible, Fazio says. “Growers were leaving land fallow, waiting for our rootstocks to become available, and when the nurseries began propagating our releases, some fruit companies ordered tens of thousands of trees with our rootstocks,” he says. 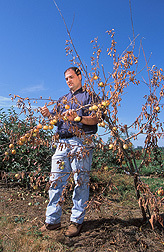 ARS geneticist Gennaro Fazio examines a limb of a Gala apple tree heavily damaged by fire blight. Researchers in Geneva have also been instrumental in developing trees with improved dwarfing and early-bearing characteristics, which are both critical traits to apple producers. 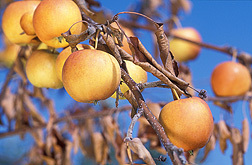 Early bearing reduces the time required for a young tree to produce fruit. Early bearing is determined by several genes, which makes breeding for it extremely challenging. The new Geneva rootstocks, however, have reduced the time it takes for a traditional large tree to start bearing fruit from 5 years to 2 years, and they are fire blight resistant as well. Dwarfing produces trees that grow to about 10 feet instead of 20 to 30 feet. The smaller trees take up less space, and that increases yield per acre. Commercial apple growers began to adopt dwarf trees in the 1930s, and since then, yield per acre has quadrupled. Dwarfing can also improve fruit quality, cut back on insecticide use, and reduce harvest-related injuries. Like their full-size counterparts, dwarf trees are susceptible to a number of pests and diseases, so growers still face tough decisions about the types of rootstocks and scions to use in their orchards. With more trees per acre, the stakes are higher. A grower who may have once spent about $3,000 per acre for about 200 trees now buys 5 to 10 times as many trees and spends 5 times as much per acre. “The density of the plantings has increased, so the amount of investment for every planting is that much greater, and every decision you make about planting becomes that much more important,” Crist says. Close-up of the leaf damage caused by fire blight. Researchers in Geneva have also focused on finding ways to improve the rootstock’s ability to take up soil nutrients, which is a key to tree health and productivity. Improved nutrient uptake could also increase the nutrient content of the fruit and reduce the need for fertilizer, which would reduce nutrient runoff. In one study, Fazio and his colleagues measured nutrients in the leaves of Gala and Golden Delicious apple trees grafted to different sets of rootstocks. They analyzed the DNA of the rootstocks to search for genes associated with enhanced uptake of specific nutrients, such as calcium and phosphorus. Calcium deficiencies cause postharvest disorders, and phosphorus is a commonly applied fertilizer. “If two rootstocks are transporting different concentrations of the same nutrients, one may have more efficient nutrient uptake or transport genes than the other, and identifying those genes will help with selection of more efficient, improved rootstocks in the future,” Fazio says. Results, published in 2013 in Aspects of Applied Biology, showed that certain genes are likely to enhance the uptake of specific nutrients, including calcium and phosphorus. In another study, Fazio and his colleagues analyzed genetic markers in two populations of rootstocks to see whether genes associated with certain markers play a role in dwarfing, early bearing, and fruit productivity. The rootstocks they analyzed had been studied and characterized at Geneva for up to 7 years. They discovered the location of a new genetic marker (Dw2) and described its relationship to a previously discovered marker (Dw1), shedding light on how genes associated with both markers and their locations affect those key characteristics. The results were published in 2014 in the Journal of the American Society for Horticultural Science. 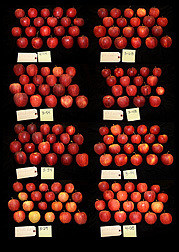 Researchers at Geneva are aware that the stakes are high for growers and others interested in quality apples.“Our goal is to give growers more choices, so that they have healthier trees, increased productivity, more nutritious fruit, and hopefully a future with reduced use of fertilizer and the nutrient runoff that goes with that,” Fazio says.—By Dennis O'Brien, Agricultural Research Service Information Staff. This research is part of Plant Genetic Resources, Genomics, and Genetic Improvement, an ARS national program (#301) described at www.nps.ars.usda.gov. Gennaro Fazio is in the USDA-ARS Plant Genetic Resources Unit, Cornell University, 620 W. North St., Geneva, NY 14456; (315) 787-2480. "Rooting Out the Best in Apple Rootstocks" was published in the August 2014 issue of Agricultural Research magazine.